Do you know what one of the worst things about blogging is? Not being able to do it (easily) from the comfort of your own bed. For you lucky folks with tablets, this does not apply to you. The rest of us with our laptops and our phones are torn: do we awkwardly lay in bed with out laptop or type ever-so-carefully on our phones to make the blogging magic happen. This just in — there’s a better solution! Ever since upgrading to the iPhone 5 I have been taking advantage of a number of new features such as Siri. Now, don’t get me wrong, Siri is mostly useless. Seriously. But for composing the odd text and, surprisingly, writing blog posts, Siri is great! Keep in mind that while I am referencing Siri, the same should apply to other dictation applications on other smartphones. Some apps like Dragon Dictation work across platforms and perform well. It takes some getting used to, but once you learn to speak somewhat slowly and dictate punctuation, the process is very simple. I was very surprised to discover that I could write posts just as quickly by dictating them as I could typing them on a full keyboard. Fairly impressive considering my average WPM is about 86. It makes sense, of course. After all, speaking is surely much faster than typing — even for us fast typers. The biggest issue is that it is hard to insert images and “pretty-up” a post from a mobile device (at least with WordPress it is). So I find myself having to hop on the computer to finish of the post. I usually finish it the next day or whenever it is convenient. That way all of the content is written when my creativity and motivation have peaked and the images and such can follow later. 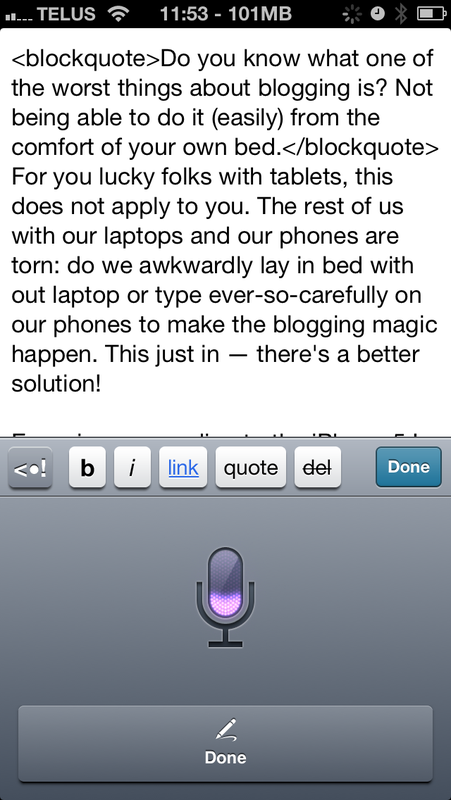 If you are an avid blogger that doesn’t like to switch it up and be comfy while writing posts, I recommend giving dictation a go.